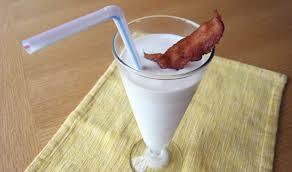 Which Has More Saturated Fat: Milk or Bacon? One 0.5-ounce (14-gram) slice of bacon = about 0.02 ounces (0.57 grams) of saturated fat. One 8-ounce (226-gram) glass of whole milk = about 0.18 ounces (5 grams) of saturated fat. One 8-ounce (226-gram) glass of 2% milk = about 0.10 ounces (2.9 grams) of saturated fat. Soy milk has almost no saturated fat. 1% skim milk still has about 0.06 ounces (1.6 grams) of saturated fat per 8-ounce (226-gram) glass. Another possible health concern related to bacon: it’s cured with a preservative called sodium nitrite, which has been linked to a variety of health issues and disease, including cancer. Bacon popularity has spread beyond the breakfast plate into such odd products as bacon vodka, bacon candles and bacon chocolate.